Comments: A relative unknown, John D. Branon was one of many rookies to fly in the Battle of Yavin. He had proven skillful enough during training to earn a place in Red Squadron. Often mistaken for Wedge on the flight deck, he was determined to make a name for himself. Unfortunately, he was one of the first pilots shot down, blasted out of the sky by Imperial TIE Fighters while acting as part of the fighter screen for Gold Squadron's attack run. 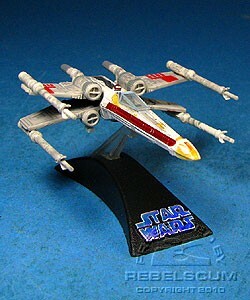 John BRanon's Red 4 X-Wing is a repaint of Luke Skywalker's Red 5 X-Wing.